KDF Leeds offers beginner courses at regular intervals (usually four times a year) for people wishing to try training before progressing onto regular training. 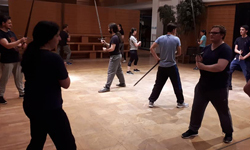 Beginner courses normally last six to eight weeks and take place on Monday and Thursdays from 7pm to 9pm at the Royal Armouries, Leeds. To enquire about availability on a beginners course, please complete and send the form below, detailing any previous experience you may have had (not essential).